An Australia-based writer and engineer has released a book which documents the true story of his experiences living on a plot of land near Melbourne once occupied by Aboriginal people. 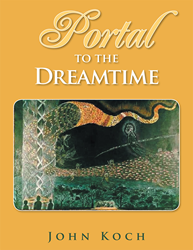 In “Portal to the Dreamtime,” author John Koch tells of his time spent experiencing the spiritual energies of the 223-acre property’s numerous ceremonial sites, artifacts and other markers of the thriving community that once dwelled there. Written in honor of and dedicated to the Australian Aboriginal people, Koch’s book describes how he used his own clairsentient abilities as well as a friend’s channeled conversations with Dreamtime spirit Wharumbidgi to learn about and work with the Dreamtime Portal, which mediated anger and despair among Aboriginal communities and allowed for reconciliation between different races and ethnicities. According to Koch, the Portal was created by the Spiritual Hierarchy as an etheric gateway to release disempowered aboriginal spirits from the fourth-dimension lower astral plane to a higher dimension. Through first-person accounts, colorful photographs and detailed descriptions of metaphysical phenomena, “Portal to the Dreamtime” delves into the deeply spiritual lives of early Aboriginal Australians, who lived harmoniously for over 60,000 years, making them one of the most successful cultures in known history. John Koch was born in 1935 and has spent much of his life in the Melbourne area. Koch holds a degree in civil engineering from Melbourne University and worked as a structural design engineer until he began his own practice in 1977, which designs and builds pole frame houses. He currently resides in Somers, Victoria. To learn more, please visit http://www.christconsciousness.net, or view a trailer for the book here.